Microsoft mix is a free add-in for Microsoft PowerPoint, which works with 0365 and 2013 versions. You just need to go to the Microsoft mix website http://mix.office.com and download it. Once installed, you get a nifty new toolbar in PowerPoint called, you guessed it, MIX. To test it out, I thought I would make a video showing how to make template pages in OneNote – a follow on from my last blog entry. Before you start, you need to get your head around the “recording” being a PowerPoint presentation. If you are just recording a video, you’ll need a single slide. If you plant to present a presentation, you’ll need the presentation prepared. If you want multiple “clips” or “shots” you’ll need a slide for each. For my demonstration, I needed three slides – the introduction video, the screen capture, and the closing video. 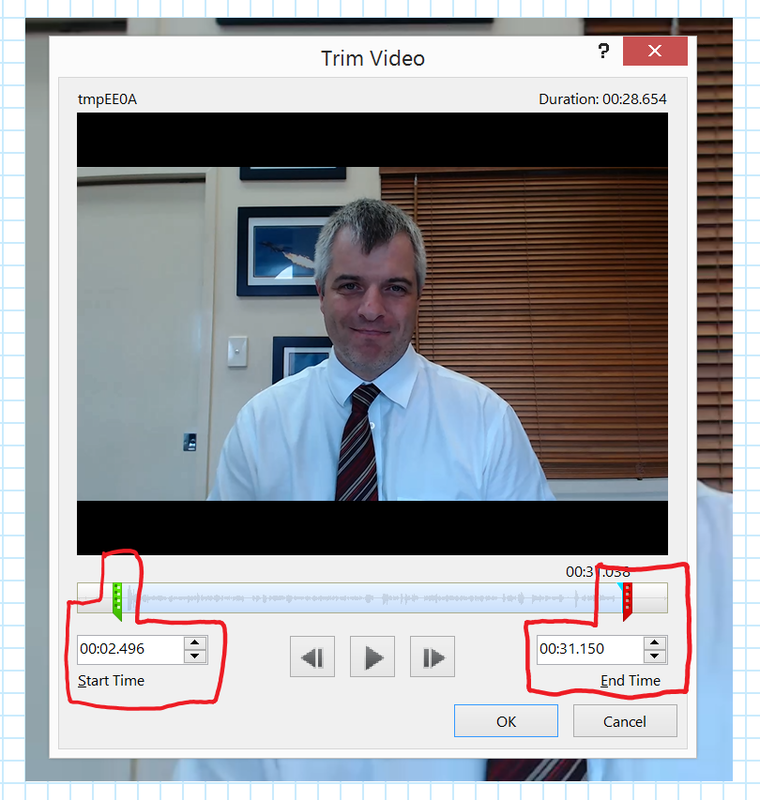 Record audio and video from whatever source you want, and adjust the recording volume easily. I found recording very easy, as was deleting my inevitable false starts! Recording the screen was just as easy, and once started all I had to really think about was my interaction with the screen. Trimming the video is a good idea, especially if you have paused at the start or end. You can also add clipart over the slides – I did a lower third title bar on the first slide with a text box and a graphic. Finally, slide transitions can be used to finesse your final product – I used a fade between slides. Once finished, exporting to video or uploading as a “mix” to the Microsoft Mix site is also very easy. I haven’t touched on advanced features such as quizzing or analytics, but that’s also possible with Mix, a great benefit for teachers, and the topic of another article at another time! The simplicity of Microsoft Mix is also its downfall for me. I wanted better video editing that just trimming the start and end (I know I could copy the video over multiple slides, and trim each section, but that just gets clunky). Part of me likes the rawness that results from a “warts and all” video, but the perfectionist in me cringes a little. I also wanted better audio editing – there is no fine volume levelling control, nor is there the ability to do noise removal – I know a lot of this has been sorted out by the software during recording, but again the perfectionist in me wanted a bit more control. When screen recording, I didn’t like that the “mix recording bar” was also recorded, and I couldn’t do anything to zoom or highlight key items in from my screen. Finally, the single “track” that you get to edit, using slides as a kind of keyframe marker, is another deficiency – I’m used to far more control over video elements. 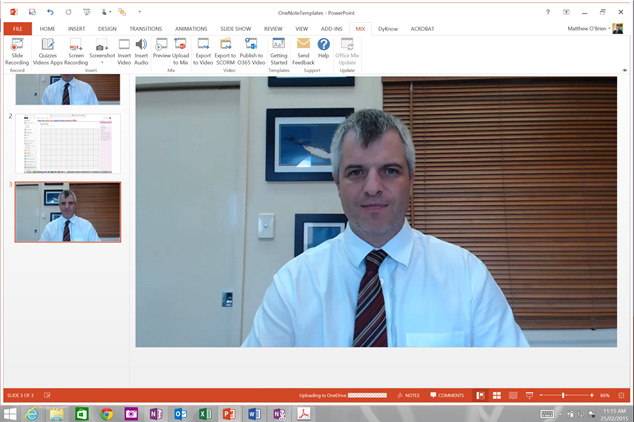 Microsoft Mix is a superb way for students and educators to enter into video recording, leveraging existing content and using a very simple interface for slide, annotation, video and screen recording. The fact it is based on PowerPoint, software that most staff and students already use, is a major plus. Get this in your toolkit! I wasn’t aware of this product. I just downloaded it. Thanks.